You may think that having one dog is such fun that you’d like to double up on your happiness by having two. And as one who has had multiple dogs for many years I can confirm that it is fun! But it’s also very hard work. Think four or five times the work, not twice the work. Because you have two (often very different) individuals to cater for, at the same time. There’s how they interact with you, how they interact with you individually, and how they interact with each other, that you have to know, understand, and manage. Sometimes people get so swept up in the melee of dogs that they struggle to get even the simplest tasks of feeding and walking done. They have no room or energy left for training. If you’re always trying to address a crowd of dogs, you’re never going to be able to assess and deal with each of them satisfactorily. They will bounce round you while you try to lead them up for a walk, for instance, and as soon as you get one to sit the other jumps on him and they’re off again. This is a common picture of preparing for a walk in a household where there’s more than one dog, and it spreads across the whole day so that every interaction becomes noisy, boisterous, frustrating, and very annoying! At this stage the owner is tempted to give up, admit defeat, and let the lunatics take over the asylum. You can turn this round. And the first thing to do is remember that you don’t have a pack of dogs, you have two charming individual dogs. They both deserve equal attention from you. So here are some pointers that will help you get back on track and build a great relationship with each dog. 1. When you first introduce a new dog or puppy into your dog household, ensure that the first dog continues to get lots of your attention, that he gets very little attention (or fuss or bother) from the newcomer, that he can find a safe haven away from the attentions of the new dog (which, after all, you chose to get - he didn’t), and is never chastised for showing his impatience with or dislike of the incomer. 2. Meanwhile, focus on building a relationship directly with your new dog that does not involve your first dog. If you just chuck ‘em in together and let them sink or swim, you’re never going to be the most important thing in your new dog’s life. He’ll see himself and Dog no.1 as “Us” and you as “Them”. So while you spare your first dog being badgered by the new dog, you focus most of your training attention on the newbie. This is very easy with a puppy as they need to sleep so much, leaving you lots of time for one-on-one interactions with Dog no.1. But even mature dogs need a lot of daytime rest too, so if you’re bringing an adult dog into your home have a safe secure place for each dog to go for these extended naps. You’ll find crates and baby-gates invaluable. 3. Limit free play between the dogs. Lots of play with you and one dog, or you and two dogs, but very little play between the two dogs. Later on they can play when they like, but not in these crucial first few months when you are establishing the new relationships. 4. Solo walks. This is essential for training and for life. My solution is to have a solo roadwalk with one of my dogs each morning by turn, and group free-running walks of two or all four at other times. This way no dog misses out on my personal attention when out or on the vital training, and they still get plenty of time to roam and explore together too. 5. Solo training. This is where many people come unstuck! They’ve seen that trying to “group-train” doesn’t work and they have every intention of working on their dogs individually. But how to do it? Put one away in crate or the other room and he cries and scrabbles at the door. Then the dog being trained is distracted too. Frustration all round. So the answer is to teach them to take turns: first you can simply name the dog and offer a treat, name the other dog and offer a treat, and so on. Each dog will learn to wait for his name before attempting to take the treat. Once they’ve grasped this concept, you can grade up to matwork. 6. Matwork is the answer to all of the questions I get which involve management of a multi-dog household. Teach each dog to stay on his bed/mat/chair regardless of what else is happening. You’ll have to do this with them alone to get started, so maybe choose a time when your partner can take one out for a walk. Failing that you’ll have to crate one near you while you start the matwork training with the other. If you follow the step-by-step process in Calm Down! Step-by-step to a Calm, Relaxed, and Brilliant Family Dog - available as a free digital download at all ebook stores - you’ll find this goes extraordinarily fast! So once they each know their own mat and what to do with it, you can start super-short sessions with both of them on their mats. I would have both dogs on their mats being rewarded between the paws as usual, then “break” one dog off the mat (you’ll learn how to do this in the book), reward the other heavily for not getting off his mat, return the first to his mat for a few treats, then “break” the other dog, reward, return to mat. Once they can both do this - and remember, one will learn faster than the other! - you can extend this by breaking Dog 1 then asking him to maybe Sit or Down or whatever trick he knows while you heavily reward Dog 2 for staying on his mat before returning Dog 1 to his mat … and so on. Each dog will have a couple of turns of coming out for a Sit (or whatever) while the other waits calmly. If they are bouncing off their mats to join in, you’ve gone too fast! Go back a few steps and strengthen your foundation work before putting it to such an extreme test. Keep sessions very short - maybe 10 treats each, over a period of one and a half minutes, then put the mats away for next time. Always keep in mind that the dog on the mat is working just as hard as the dog having a training session with you, and needs to be rewarded at least as frequently as the dog who is off his mat. You will soon be able to do extended training sessions (several minutes) with one dog while the other waits patiently for his turn. Switch them round and off you go again! 7. Once both dogs know exactly what to do on their mats, you can teach them to keep in whatever spot you choose for them. When I’m training in the garden, three dogs will be parked on top of the picnic table while I work the fourth. Indoors I may just drop them wherever they are (or there are lots of beds around the place they can choose!). Now you have a fully portable behaviour of keeping still when required, whatever the temptation and excitement. 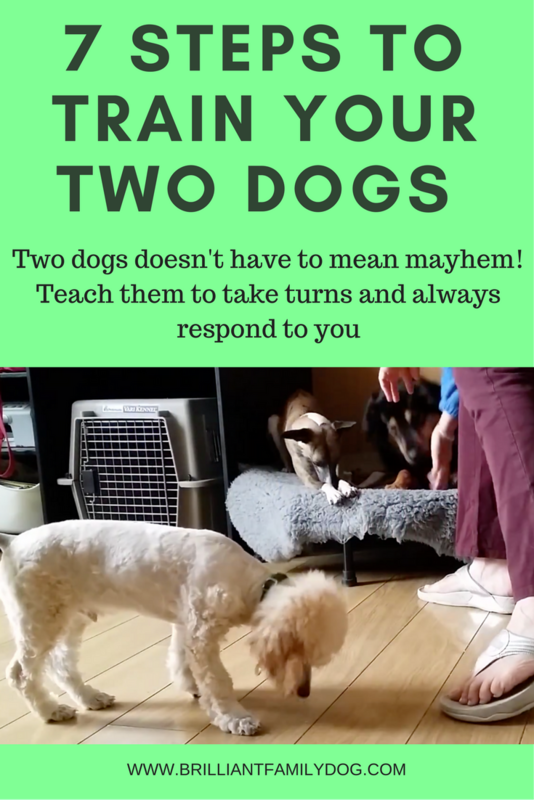 Once you’ve got this going well, you can extend the dogs’ impulse control and get them both waiting nicely when you want to put on their walking gear, have them sit at doors till you open them and release them one by one by name, have them wait in the car till called out individually, and so on. You can accommodate their individuality, and their individual speed of learning. You can understand their fears and foibles and know what each dog needs to live a happy life. Of one thing I’m fairly sure: once you’ve experienced the fascination of having two different personalities with their own likes and dislikes and their own individual personalities - with hopefully an increased understanding and tolerance of all dogs, however different from yours they may be - you probably will never want to go back to having only one dog again. So that statement contains an awful warning! When you start out with a multi-dog household, you’ll probably have a multi-dog household for ever - there’s no turning back. Make sure you have the time needed to put in all the extra work, especially in the first six months or so, which will make your family life run smoothly and without chaos and mayhem. I have a reactive dog - can I get a new puppy too? Rollo the Border Collie initiates play with Coco Poodle at 15 weeks - 7 weeks after he arrived! Many people who have a reactive dog - one who looks ferocious to strange dogs - wonder if they can ever have a puppy again. And they wonder if their reactive dog would accept the puppy or whether it would all end in tears. They may long to give their anxious dog a playmate. This is a nice reason - but quite a lot of dogs are not very interested in playing with other dogs. Even in my busy household, play between any or all of the dogs only happens occasionally - and fairly briefly - and when they’re already excited about something. There are lots of smaller interactions going on, of course, but not necessarily play. Whether this is the right step for you is something you have to assess with your individual dog. Most adult dogs will - eventually - accept a puppy into the home. Some take a long time, while others are delighted and bond immediately with the newcomer, their behaviour perfectly appropriate and gentle. You can get an idea from your dog’s reaction to a very young puppy by allowing him to see one - but your first consideration here would be the safety and wellbeing of the puppy. Early bad experiences can be hard to erase. So possibly a puppy held in someone’s arms, behind a fence, while your dog observes from whatever is a safe and appropriate distance where he won't bark and frighten the pup. So assuming that passed off peaceably enough, actually introducing a young puppy into the home will present its own challenges! If your reactive dog is one of those who is not keen on puppies in his face - like my Border Collie Rollo - you’ll need to keep them largely apart for a long while. But it can all come good in the end, and Rollo is now totally accepting of the three younger dogs in the household, and often initiates play with them. When he’s had enough, the game ends. So you may be surprised - and delighted - at the success of the initial introductions. But this is only the beginning! I just want to give you a little guidance going forward. You need to focus largely on your new puppy for the next 9 months or so. He’s only going to learn if you put in the flying hours! New pups should be kept separate from older dogs most of the time. Yes - most of the time. You can’t just chuck ‘em in together and hope that it will all go swimmingly. It’s easy to keep them separate because your new puppy needs to sleep around 17+ hours a day, so all that sleeping time should be spent in his crate, in a playpen, or in a separate room. A playpen that opens out as a zigzag that will divide a whole room is really helpful for when the puppy is awake. Last time I had a puppy in the house, the playpen formed a long barrier across the kitchen. The older dogs could go in and out of the garden, upstairs, wherever they wanted, but I didn’t have to worry about the pup’s safety if he annoyed them. So the dogs were not excluded, and could study the new creature in the secure knowledge that they couldn’t be molested by the tiny fluffball! Remember that your older dog didn’t choose to get a puppy - you did! The general rule of thumb is that your new puppy can play with your older dog for one third of the time he plays with you. So if you interact/train/play with your puppy for one hour a day, that means he gets twenty minutes playing with the older dog - preferably in 3-5 minute chunks through the day. People gasp when I tell them this, as I can see in their eyes that they’re reflecting on the fact that at the moment their dogs have 24/7 access and are forever playing roly-poly games on the carpet. But it’s something you have to do. These early weeks and months are such a valuable time for bonding with your new charge - don’t waste them! Respect your older dog and make sure he always has space and is never pestered - especially if he’s not so agile any more. Imagine visiting a friend’s house and her children treat you as a climbing frame, poking fingers into your mouth and ears - no, you wouldn’t like it! Sooner or later your puppy will lose his puppy licence and your older dog will say, “That’s it! I’ve had enough!” and snap (or worse) at him. Ensure this can never happen. Make sure to have lots of private time with your faithful older dog, alone. As he is reactive and has his own issues and worries, you’ll need to continue your program to make life easier for him when out. While your training focus should be firmly on your puppy, whose developmental stages will fly by if you’re not paying attention, you’ll find that two dogs does not equal half the work (as you may have thought) but at least twice the work! Never leave the two alone together. Just never. Not just for their safety, but also because what may seem a bad idea to a lone dog (like shredding the cushions) may take on a different hue when a young ragamuffin says “Let’s! I dare you!” When you’re not with them, they should both be asleep. Remember that your prime task right now is introducing your puppy to our world and everything in it, before he reaches the age of 14-15 weeks. The socialisation window gradually closes between 12 and 16 weeks and new things met after that can result in distrust or fear. Follow closely a good guide on Puppy Socialisation, Habituation, and Familiarisation, and ensure all novelty is experienced with a calm, happy puppy. You know a lot about dog body language by now from your reactive dog: watch your puppy like a hawk to learn his signals. Don’t make the common and disastrous mistake of thinking that playing with your older dog at home is a substitute for thorough and careful socialisation! Your brand new puppy doesn’t have to meet dogs yet, but definitely has to see loads of them. All different activity types, colours, coats, ears - they’re all different and new pup needs to experience all of them. Carry him if he hasn’t had his jabs yet. And NO group walks for now. 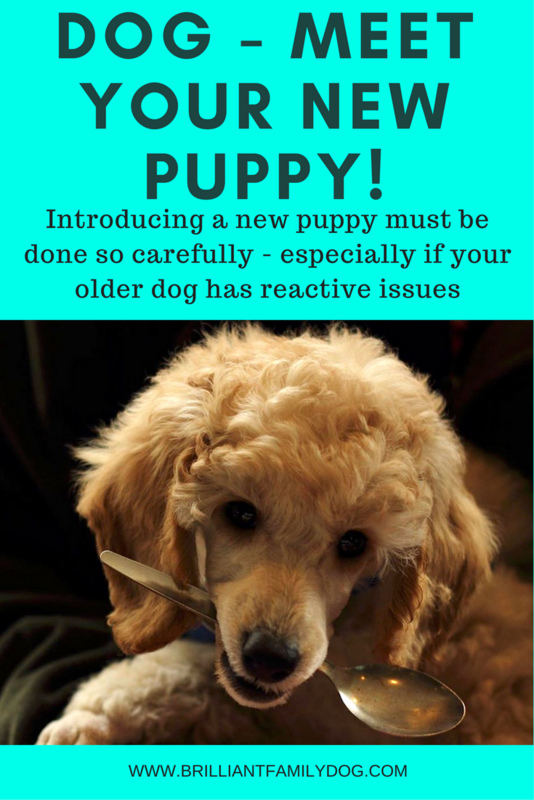 Reactivity is highly catching, so you want to introduce your puppy to the outside world with no fears and poor examples to copy. I wouldn’t walk my new puppy with my reactive dog till pup is at least 6 months (depending on breed - larger dogs 9-12 months minimum). You have the rest of your lives together to enjoy a great relationship - between you and your older dog, between you and your new dog, and between the two dogs themselves. Don’t hurry and skip any of these vital steps. The time will fly by much faster than you anticipate. Anything you may regard as restrictive at first sight will be seen to be just plain ole commonsense - and will become an automatic part of your management plan for your household. Enjoy your new puppy! And for help with all of those puppy nuisance behaviours you’d forgotten all about - get your free email course to deal with them kindly and easily. And hunt around the Blog to find help with Housetraining, Sleeping through the Night, and so on.